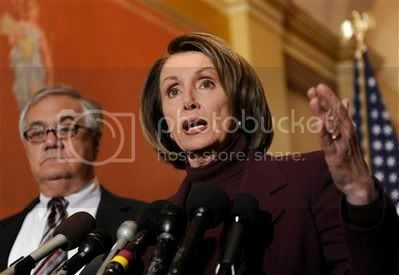 Or does Nancy Pelosi look a bit like Severus Snape in this picture? Sorry I missed your earlier post! Glad to hear I'm not the only one who thinks so. And you didn't miss much. Wonder what's in her wand? and she's got man hands... severus in drag? Well maybe a little bit. But he's MUCH sexier. Well, yes. Alan Rickman is the hot butter on the sausage gravy and biscuits of love. Yeah! *Bows* Oh Master of Metaphor. *Giggles* I plagarizaed myself with taht one. I used it first when discussing Jeremy Irons in Brideshead Revisited. Ah yes, most applicable there also. It's so sad that such a wonderfully talented and handsome actor has been forced to take roles in Eragon and Dungeons & Dragons. someone needs to get him a real movie and soon. Gosh, I didn't know that. Agreed. She looks scarier. I hope the Dems don't keep her on as speaker. She's had her foot in her mouth too much, and she usually comes off as shrill and uneducated. "I'm trying to save the planet! I'm trying to save the planet" repeated over and over in response to very serious questions about energy issues, and why she stopped congress from continuing the discussion and tried to make it impossible for those who chose to stay and actually WORK on the problems to do so. I'm hoping things in congress ettle down a bit now. But I'm not holding my breath.